Hospitality rituals were an important feature of the ancient Near Eastern world – and a sense of the importance of these formal and informal customs lingers throughout the Middle East until today. George Steiner has addressed the way in which hospitality is also fundamental to arts and culture; how the virtue of hospitality should also inform how human beings encounter and receive art. Lewis Hyde’s book The Gift, which has a cult following among artists of many stripes, is not primarily about hospitality rituals per se, yet its treatment of gift culture reflects upon many dimensions of hospitality. Hyde discusses the difference between a commodity-based economy, built on a quid-pro-quo transactional model, and a “gift”-based economy. In a gift economy, you can’t really put a price on anything, transactions take place through a chain of giving; and rather than compensate the giver for its value, the recipient of a gift has an obligation to keep that gift moving by turning around and giving to others. In modern times our economies are based (thankfully) on the notion of equitable transactions, but the realm of art remains one governed by the gift. A painting can of course be bought and sold in a traditional transaction, but as a work of art it can never be truly owned. Hyde associates the gift-economy with virtues such as generosity and expansiveness. A true artist, according to Hyde, embodies the spirit of the gift as he gives and receives with abandon. He does not hoard his talents and keep them for himself – he shares them with the world and this gift presumably keeps moving. For Hyde, Walt Whitman exemplifies this spirit both through the messages of his poems and in his very persona. 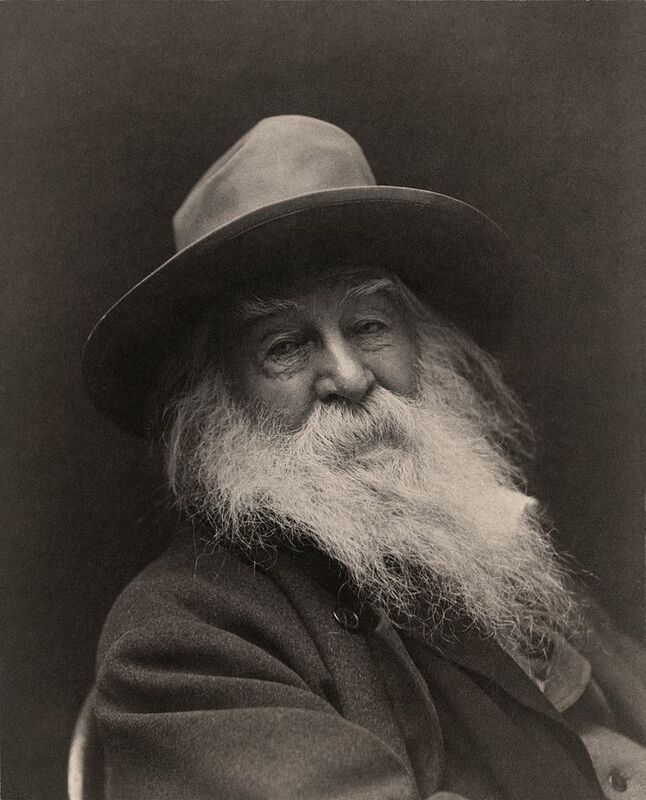 Whitman’s refusal to erect barriers between himself and his fellow men, and his incredible generosity in his personal life and his art, infuses his poetry with a special kind of expansiveness. Hyde does not discuss Avraham in this specific regard, but it is likely that Hyde would recognize Avraham’s distinct quality of hospitality as being a fundamental part of what makes him a man of God. In The Gift, Hyde also describes what happens when hospitality goes awry, specifically in reference to Native-American “potlatch” or gift-giving ceremonies. In theory, the potlatch is a noble expression of generosity and the impermanence of material possessions. However, at times they have historically turned into episodes of bizarre and seemingly wanton destruction of material goods. Hyde believes some of this is a product of the toxic combination of Native American gift culture and European style capitalism. Hyde also invokes the festivals surrounding the Greek god Dionysus in order to make sense of these festivities. Dionysus is a Greek god who is dismembered and then reconstituted, or “broken into higher life,” and the celebrations surrounding his cult were traditionally decadent and debaucherous. 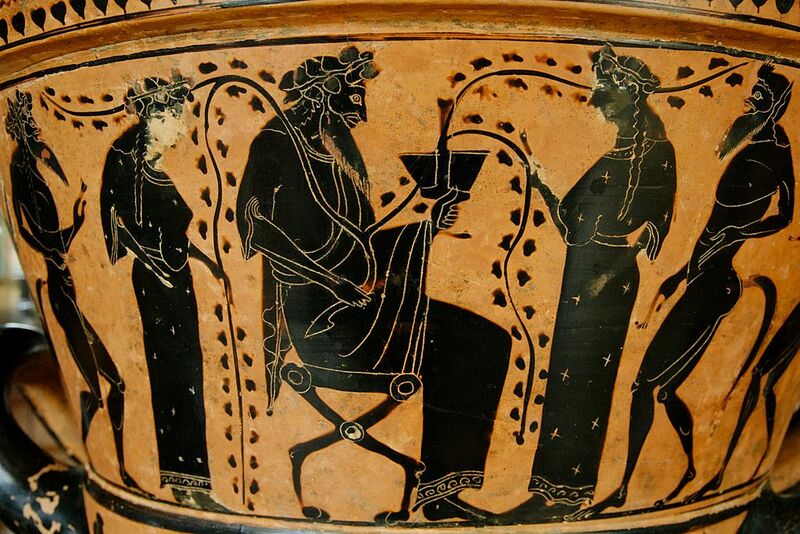 Dionysus is also associated with wine and fermentation, the process by which grapes turn into wine also evokes that path from destructionto regeneration. Potlatch and Dionysus represent a darker side of gift culture. A key feature of Hyde’s argument in The Gift is that generosity begets generosity. An important feature of any gift is that it keep moving, and not only in a reciprocal direction. The chain of events that we see in Vayeira exemplify that kind of movement. Avraham treats the messengers of God with generosity, and he is then the recipient of the wonderful gift of a child from God (not from the messengers). Perhaps it is even in response to Avraham’s spirit of openness that God in turn opens Himself up to Avraham, as he says in 18:17, “Shall I hide from Avraham what I am about to do”? God then reveals to Avraham His plans to destroy Sodom, and Avraham argues for God to instead save its people. Many have commented on how Avraham’s arguments here reflect his sense of social justice and the inherent unfairness of destroying any potential innocents along with the guilty. Yet I think Avraham’s entreaties here also reflect a certain generosity of spirit that is not necessarily founded on principles of abstract justice as much as the same sense of magnanimity that motivated his earlier actions. Sodom hear that Lot has shared his home with guests, they demand they he “share” the guests with them too, presumably in a sexual sense. Lot does not want to be a bad host, so in an act that is not so much a gesture of hospitality as a caricature of it, he offers-up his own daughters to the hedonistic horde instead. Despite Avraham’s best efforts, Sodom ultimately reveals itself to be beyond redemption, partially because they seem to have perverted the conception of what hospitality involves. When faced with Lot’s open hand they take from it and demand more. This is in contrast to the spirit of “the gift,” as exemplified by Avraham and articulated by Hyde, which is to keep the spirit of generosity moving. On the other hand, in the demand for Lot to share his guests with the inhabitants of Sodom, and Lot’s own willingness to give over his daughters, the whole episode does express a kind of dark openhandedness, in the mode of potlatch or Dionysian worship. The rapacious sexuality we see exhibited by the inhabitants of Sodom is not the only Dionysian element in Parshat Vayeira. 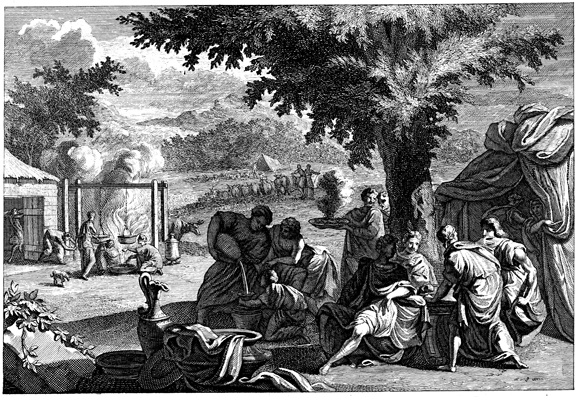 In the episode shortly following the destruction of Sodom, Lot’s daughters inebriate him with wine and then cross an ancient forbidden boundary in order to “maintain life.” It’s hard to say that Lot’s daughters are sinning here, as they seem to truly believe this necessary for the continuation of humankind, but it’s striking to contrast the two models of hospitality exhibited by Avraham and Lot, respectively. Avraham’s hospitality is bright and airy, future-oriented and constructive. One can imagine him spreading his interconnected messages of monotheism and hospitality in a generous Whitmanian mode, “I celebrate myself, and sing myself/And what I assume you shall assume/For every atom belonging to me as good belongs to you.“ Lot and his family’s model of giving, or “letting go,” represents a kind of Dionysian descent into the darker regions of human inclination. Just as Sodom needs to be destroyed before it is reconstituted, in the Lot episodes the death-instinct and life-instinct are closely intertwined. Lewis Hyde does not spend much time investigating or distinguishing between these two models of generosity. He is more invested in simply raising awareness of the values of gift-giving, generosity and hospitality to begin with, as he believes they are easily overlooked in a culture that is obsessed by material acquisitions and consumption. Yet the contrast between Avraham’s life-affirming and Lot’s destructive model of hospitality is, I believe, significant with respect to the Biblical narrative, and may even offer some insight into what otherwise seems to be a disconnected element of the Torah portion: Akeidat Yitzchak, the Binding of Isaac. Many read the Akeidah as an act of blind and heroic faith on the part of Avraham. Others understand it to be an articulation of the Torah’s supersession of the pagan custom of sacrificing one’s firstborn. This second group focuses on the moment when God tells Avraham that he does not need to sacrifice his son. Yet, in interpreting the story and Avraham’s actions here, it may be instructive to examine the only other case of child sacrifice we see in the book of Genesis – when Lot offers up his daughters to the mob. For Lot, this is the ultimate act of generosity, of giving up something that is dear to him to satisfy the imperative of hospitality. When Avraham is asked to sacrifice his son Isaac, perhaps he also interprets this request in a similar vein as reflecting the darker side of Dionysian-style self-abnegation and sacrifice, of the intertwining of the death-instinct with the life-instinct. The triumph of the story is that Avraham learns that he can have his cake and eat it too – that his generosity toward God does not have to involve losing something of himself. As Walt Whitman put it: “I know that the hand of God is the promise of my own/ And I know that the spirit of God is the brother of my own.” Hospitality is in some ways the inverse of sacrifice, it represents the possibility of giving without depletion. Akeidat Yitzchak represents one powerful paradigm for understanding the life of faith, and too often in Jewish history we have seen our own Yitzchaks bound and led to slaughter. We should not forget, however, that Avraham is defined primarily by his expansive and life-affirming hospitality, and this too can enrich our sense of the Jewish mission in the world. Hey Sarah, loved this post. I think one thing that differentiates Whitman’s sense of hospitality and openness from Avraham’s is that Whitman’s comes with a sort of self annihilation. His sense of self is so expansive – includes everyone, really – that it’s ultimately hard to say who he really is. Avraham, on the other hand, seems to have a very clear sense of self. He knows who he is, by what he is constituted, where his boundaries lie, etc. This, in some sense, is what his argument with God is all about – Avraham’s clear sense of self butting up against God’s will. I guess I have the sense that Whitman wouldn’t quite be able to argue with God like that, because to do so demands someone fully individuated and contained, hospitable and generous though he may be. Great to hear from you Ma’ayan, I think that’s an important point. The comparison with Whitman only highlights one dimension of Avraham’s personality, but there is also the part of him that smashes idols (at least in the midrash), that agrees to expel Hagar and Yishmael, and that insists on purchasing Ma’arat HaMachpela in clear terms even when it is offered to him in the spirit of the “gift.” I believe there is a degree of appreciation in the Torah for the unchecked, unbridled “original energy” represented by someone like Whitman, but the project of Judaism seems to also be a process of reigning in that energy in a productive manner. Your thoughts on these topics are, as usual, beautiful and thought provoking. However, I am struggling with your final point regarding Akidat Yitzhak (which is such a struggle to understand in the first place). My understanding of your interpretation is that you are assuming Avraham did not want to follow G!d’s command to sacrifice Yitzhak, as it is diametrically opposed to his view of “generosity” and the “chidush” of the story is that G!d, at the last moment, reveals to Avraham that his generosity instinct was correct from the start. By extension, Lot’s “generosity” is further confirmed to be not inline with G!d’s wishes for our behavior. But what are we supposed to learn from Avraham’s willingness to abnegate his own (correct) generosity-intuition for what ends up being not-G!d’s. In a world where we live without nevu’ah, how can we apply what appears to be a seminal episode to our own lives when, from this interpretation, the only greatness that Avraham has demonstrated is a willing to supress his own will for G!d’s when it is directly presented to him, as opposed to listening to the sense of hospitality/morality that G!d has helped him cultivate in the first place? And when you invoke generations of seeing our own “Yitzchaks” bound and led to slaughter — the paradigm does not ring true because Avraham was informed he did not have to offer his son! I have often entertained the notion that Avraham failed the Akeidah — that perhaps G!d wanted to find out whether Avraham would not only stand up for other innocents (i.e. S’dom), but stand up for his own son and himself. And he doesn’t. So G!d had to intervene. Perhaps, in the end, Avraham is guilty of falling into what, borrowing your analysis, is a hospitality-trap, in this case towards G!d. And if you believe in the specific Jewish-cyclical view of history that everything that happens to us has already happened to the Avot — it is nothing new that in today’s world, it is often Jews, out of a sense of innate morality (there is a great New Yorker essay on Noam Chomsky where he admits he sees himself in the tradition of the prophets) that are the first to put the Greater Jewish People/Israel on the alter. Maybe, it is a “generosity” we got from Avraham. Hi Michael, I hope all is well. I appreciate all of these insights, thank you for sharing them. 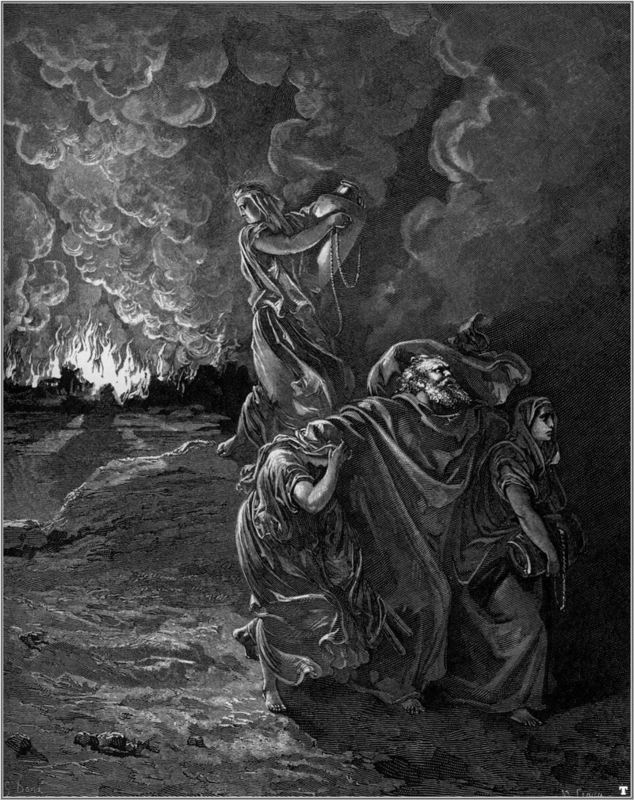 The idea that Avraham “failed” this test is an interesting one, I have heard others comment upon the disconnect between Avraham’s unquestioning obedience here and his argument for Sodom. To me, the hospitality/gift paradigm helps harmonize these two aspects of Avraham,- he is generous toward the people of Sodom, and he is generous to God in offering Him his son. But the generosity looks very different in the two instances, and that is explained in part through the contrast with Lot/Dionysus. After the Akeidah God does praise Avraham for his obedience, and He promises to shower blessings on him and his descendants, which would seem to indicate that he passed the test. But the manner in which the blessings are articulated is indeed strange, particularly in how much they emphasize “zarecha” (“descendants.”) Your analogy between Avraham and self-hating Jews is also intriguing, as usually readings of the Akeidah see Avraham as putting aside his sense of universal morality in order to follow the particular and potentially arbitrary will of God. You suggest that in blindly worshipping the gods of secular liberal values, some Jews are actually sacrificing (or selling out) their own people and country in a manner that resembles the Akeidah. I have not heard that one before 😉 Stay tuned next week for Chayei Sarah, you will appreciate Avraham’s actions in unequivocally buying Ma’arat haMachpela in Chevron from Ephron the Hittite. There are some things even Avraham will not give up. Thanks again for your feedback! Hi Sarah, Several points came to my mind throughout the day. I’m glad no one stole my thunder while I was unable to post all day B-)…and if I mention something you already brought up it is merely my forgetting. I was thinking of rabbinic sources to support for your idea. 1) In Pirkei Avot Avraham is compared to Bil’am, chapter 5 –either mishna 22 or 19 ,etc. depending upon your version of the text– “Whoever possesses the following three traits is of the students of our father Abraham; and whoever possesses the opposite three traits is of the disciples of the wicked Balaam. The student of our father Abraham עין טובה, ונפש שפלה, ורוח נמוכה” Ayin Tova should be explored (and you may be able to tie in the other two so make one idea under your rubric (Robert word)). Many financial themes with Bil’am can possibly be contrasted to Avraham Avinu and generosity of spirit. Bil’am was not allowed to . Tzarat ayin is usually the parlance for stinginess, though, in rabbinic literature. (see my next idea). It may be describing positive outlook or general generosity of spirit, or Bil’am having “jerkiness” or a closed off demeanor or something like that. Something to explore 2) Many rabbinic sources and some halacha talk about Ayin Yaffah, which means giving generously in the context of food or giving… such as the baal habayit doing hamotzei so the botzeia will be giving with ayin yaffah. ” כי הא דאמר ריו”ח משום רשב”י, בעל הבית בוצע ואורח מברך. בעל הבית בוצע, כדי שיבצע בעין יפה. ואורח מברך, כדי שיברך לבעל הבית” . Ayin yaffa also describes transactions in which the giver gives more than the exact amount ” נותן בעין יפה”. That can be explored and if i can get on a search engine I will look for some examples. But it is exactly the idea of generosity of spirit, versus tzarat ayin, stinginess–closed off,uptight about giving. Tzarat ayin one of the reasons someone receives tzaraat. No generosity of spirit, then one stays alone with tzaraat. 3) In a totally different vein, my rabbeim in Israel in my undergrad yeshiva always pointed out that Avraham was essentially doing chesed to robots: G-d made fake guests for Avraham to provide for (yes the talmud -Bava Metzia I think- learns out actual chesed form here,but 1-Rambam learns most drashos are asmachta 2- torah text can be studied and darshened on many levels). This would need to be explained, as chesed is providing for someone’s need, and Avraham should not be seen as someone who is so obsessed with chesed that it would be about his needs-like people who are perpetual caretakers beyond the exact need of the recipient. Perhaps the idea could be that Avraham is demonstrating or G-d is teaching him that generosity of spirit is a trait that we must imbue in ourselves, even if no recipient is around. Sort of like on Star Trek or X-men wen the fight holograms or machines in a special room to prepare or real battle, but with this imbuing one with internal character traits. These are fascinating sources Ian, thank you for sharing them! I actually thought about the “chesed to robots” hypothesis myself, thankfully Avraham also argues for Sodom 😉 I think there’s a lot to unpack regarding Bilaam and the gift, especially in regard to language, and I hope we get a chance to explore it when that parsha comes around. I didn’t mean that the robot thesis would knock out your idea totally or preclude a thesis describing his deeds as a genuine step. It’s just to add a new idea or reading/dimension on top of yours. In any event, over the weekend I thought more about the post, and was reminded of the passage in in Bava Metzia that makes an inference in how Avraham describes the flour to be used for the bread for the guests. This opinion highlights the opinion that women are stingier–same idea of “tzarat ayin”– than men when it comes to (giving to) guests. 1) perhaps another aspect of generosity of spirit, especially by a baal habayit. 2) I don’t think this is meant to be a blanket sexist statement, but, rather, a description of general trends within genders. Women tend to be more concerned with safety and preservation in the home. Gottman (1999) in his extensive research of couples found that women bring up marital and household problems more than men. I once heard in an interview with Kevin O’Leary and he said that the women who invest with or take advice from him are more conservative with their investments. I’ve seen it happen the majority of the time with divorces or split-up couples in my psychotherapy practice that the father spoils the child and the mother has to be more conservative or strict. Of course we know women who waste their money and men who are careful with money, but we’re speaking of trends and the bottom line when being generous or not in such a scenario. (definitely themes of chesed and gevurah here, opening up and self-preservation, but I don’t want the kabbalah terminology to distract us). Just to share more while we’re on the topic: I believe genders were made with complementary so each one would highlight another area of benefit, and, through communication, reach a reasonable, balances conclusion. It may also arise that someone would put their foot down when necessary. I believe it’s a gender version of a similar to the idea of “complementary” that Salvador MInuchin, the developer of structural family therapy, uses to describe relationships–couples (1998) and families (1978; 2013). When couples get married they end up settling in and each picks up where the other leaves off. This can be a sort of division of labor, end up being typical patterns couples have as “flash points”, or create unhealthy patterns. One does the online banking and bills and one shops, and they slowly give power to the other in those cases and forget somewhat how to do them. (one family therapist argues that this is one of the reasons why divorce is so painful: now that one is on his or her own, he or she is missing part of their (shared) memory). A flash point may be that one partner giving the other more power, in order to be taken care of, (and then wanting it back later and causing a stir). It may also be one spouse speaking louder then the other, which makes the second one tanse and withdraw, and then the first one wants to raise their voice yet more. Still in all, in general, it means that family members construct one another and the way to change them is through changing their patterns and “rebalancing” the relationships. Direct instruction or agreements among the family prove inept. Gottman, J. M. (1999). The marriage clinic: A scientifically based marital therapy. New York: Norton. Minuchin, S., & Rosman, B., & Baker, L. (1978). Psychosomatic families: Anorexia nervosa in context. Harvard University Press: Cambridge. Minuchin, S., Nichols, M. (1998). Healing families: Strategies in hope and understanding. Free Press: New York. I’m re-reading your piece, trying to understand why one would say your approach over the alternatives. You have vastly more knowledge than I in many areas of study including literature, history, and middle east studies. It may be that this is an appropriate reading and other readings would not be excluded, but i’m looking for something that would indeed preclude other readings so as to make your argument exclusive. Why would social justice or an obsession with preserving life (and no emotion whatsoever) or other theses be ruled out? It seems your approach is not an approach based on answering odd or nuanced language in the text, or the like (such as a sentence in Mishle or Tehillim soeaking of Avraham and a unique word for generosity. I don’t mean to say everything needs a precedent and to be strict and super religious about reading. Just clearer nuances ). Instead it’s a reading based on some unique story-line presentations, which are broader items to work with, though if course valid nonetheless. It is based on the juxtaposition of generosities in the beginning (Avraham to guests and G-d to him) a connection of this /expanse of it to an act in the middle (Avraham and S’dom) and then an advances twist at the end. One could explain the two generosities as not being connected or in a different light. It’s an interpretation of a literary flow and I will not say unreasonable or un-kosher at all, don’t get me wrong. But does it preclude the other readings, or is it just a really beautiful (and accurate) reading? And are there more specificities you can share or I missed? In the middle, you said the main idea, then brought the approach of Lot and, by contrast through implication, impliedAvraham’s approach. Then you stated Avraham’s approach in a more all-inclusive broad, beautiful way. I would like to see the thesis about generosity of spirit or whatever it may be called directly stated again and linked to the text or nuances or the like. At least clarified if they aren’t there. Or tell me why my question is off. Hey again Ian! Yes I definitely agree. I’m not offering a comprehensive theory of what motivates Avraham or what is going on in the parsha. My goal for the blog is to show how putting the Torah in conversation with certain literary texts may unlock elements of it, or provide insight, that we might not otherwise get from traditional commentators or Bible scholars. That doesn’t preclude the insight we get from those other sources though, just adding one more perspective in the spirit of Shivim panim l’Torah 🙂 Right now Robert is writing a rebuttal to my post which will hopefully appear for Chayei Sarah, so you will get to hear an alternate view. And of course I welcome yours as well! I can’t wait to read Robert’s post. I do think you’re touching upon things in the text, though. Just to argue FOR you post here. It does seem important to the torah to put the seminal example of giving next to him hearing of his own being given to, so to speak. Our sages say that G-d treats someone they way she or he treats others, in that example it is being really strict to/on someone. BLIYAL means, of course, famously idiots and/or idolaters. A link between monotheism and generosity (? )..at least a terrible sin to be stingy, but perhaps related to religion. I’m sure it’s been explored before. And the simple approach would be, once one believes in Gd, one would believe in some set of rules here, then one would believe in doing good to others, etc. That aside, something to explore: generosity relating to Avraham’s monotheism.